The thin border strum across the region between two nations at war has always been subjected to changes, the Prime seeping out from the constant clashes soaking the ground and imbuing it with special properties. But nothing prepared them for what they were to see, for neither the brightest of Dokht minds nor the empowered visionary artists of Adornia could predict that the toxic and strange Prime would actually take such a toll. Although unnoticed, the land was changing slowly, the distracted heroes however unable to give importance to the ground shifting beneath their feet. The geography of these lands was now changed from what the heroes had, leaving some to wonder why their outdated maps indicated different routes. Along with these changes came a new beast, a creature that took residence inside these lands, this new Prime-drenched entity drawing forth the heroes, wanting to absorb the precious Prime for themselves. Standing tall above any daring challenger and donning a dark fur with red undertones, the creature resembled an oversized feline with a broken chain, leaving some to ponder on its origin. Was this creature the result of the raging war, or was there something much more sinister behind? 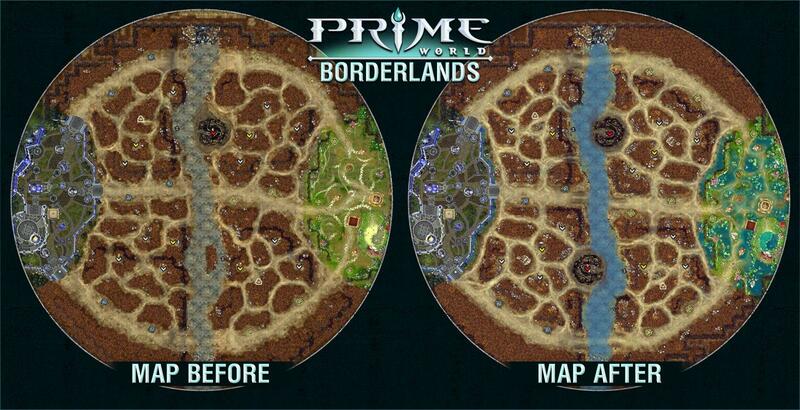 Borderlands will be undergoing some changes soon enough, these being implemented to create a certain symmetry and level out the playing field for both sides, this changing mostly the jungle and making way for our new little friend. One thing is known though, it requires a name, a name that only those that have seen it can attribute, only you can Nobles! This is a contest to name the new creature that will be landing in Borderlands soon enough! To participate, head over here! * The participants post the name and the reason they believe this name would fit. * Submissions are accepted until midnight EST, 6th January 2014. * The winner will get 200 gold and a hero code of their choosing! * Nival reserves the right to not choose a name from the community if none feel satisfactory.